Kathleen E. Conley was born on June 27, 1947 in Lynwood, CA to John and Katherine (nee Sine) Smith. She died Monday, January 21, 2019 in Arlington Heights. Mrs. Conley worked as a Special Education Teacher for Cypress School in Ontario, CA. 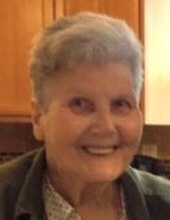 She was a member of St. Edna Catholic Church in Arlington Heights, and Young at Heart. Kathleen enjoyed reading, church, Wheel of Fortune, and loved to volunteer. She loved to spend time with her family, especially her grandchildren, and was loved by all. Kathleen is survived by her spouse of 47 years, Joe; children, MaryMargaret (Timothy Hunter) Kahanic, Colleen (Chris) Hesse and Erin (Brendan) Bauler; grandchildren, Kayla Kahanic, Liam Kahanic, Josh Conley, Parker Sipola, Natalie Hesse, Bennett Hesse Conlan Bauler, Brogan Bauler and Dublin Bauler; siblings, David (Bobbie) Smith and Marilyn (Tom) Martinez; and many nieces and nephews. Visitation Monday, January 28, 2019 from 3:00 pm until 8:00 pm at Glueckert Funeral Home Ltd., 1520 N. Arlington Heights Road, Arlington Heights, IL 60004. Visitation 9:00 am, Tuesday, January 29, 2019 at St. Edna Catholic Church, 2525 N. Arlington Heights Rd., Arlington Heights, IL 60004 until the 10:00 am Funeral Mass. Interment is private. "Email Address" would like to share the life celebration of Kathleen E. Conley. Click on the "link" to go to share a favorite memory or leave a condolence message for the family.